BATF wins Best Beauty Blog Post 2009 from Spa Week! I was SO excited to find out right after I landed in NYC that Spa Week has awarded BATF with the Best Beauty Blog Post 2009!!! 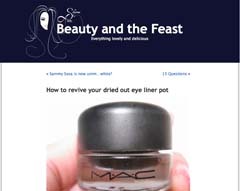 I’m so thrilled that BATF reader, Sidrah Hyder, has won the $624 beauty swag from Spa Boutique by expressing her love for the post about reviving your dried out cream eye liners. Congrats! Don’t forget to claim your prize! Keep reading Spa Week’s daily blog for more giveaways — they are giving away all 90 of these beauty products! YES, go claim your prize! Yeahh they’re giving away a whole line of Redken shampoo for volume! shy im soooo happy for you — wish you all the best and more—loveee you. CONGRATULATIONS again!! Shy and all your BATF readers rock!